London Bridge is a central London railway terminus and connected London Underground station in Southwark, south-east London. It occupies a large area on three levels immediately south-east of London Bridge, from which it takes its name. The main line station is the oldest railway station in London fare zone 1 and one of the oldest in the world having opened in 1836. It is one of two main line termini in London to the south of the River Thames (the other being Waterloo) and is the fourth-busiest station in London, handling over 50 million customers a year. The station was originally opened by the London and Greenwich Railway as a local service. It subsequently served the London and Croydon Railway, the London and Brighton Railway and the South Eastern Railway, thus becoming an important London terminus. It was rebuilt in 1849 and again in 1864 to provide more services and increase capacity. Local services from London Bridge began to be electrified at the turn of the 20th century, and had spread to national routes by the 1930s. The station was extensively rebuilt by British Rail in the 1970s, along with a comprehensive re-signalling scheme and track alignment. It was further developed in the 2010s to better accommodate the Thameslink route which provides a connection to Gatwick Airport, Luton Airport and Crossrail. London Bridge is served by Southeastern services from Charing Cross and Cannon Street to destinations in southeast London, Kent and East Sussex and is a terminus for many Southern commuter and regional services to south London and numerous destinations in South East England. Thameslink services from Bedford, Cambridge and Peterborough to Brighton and other destinations in Sussex and Kent began serving the station in 2018. The main line station is one of 19 UK stations managed by Network Rail. It has a ticket hall and entrance area with its main frontage on Tooley Street, and other entrances on Borough High Street and within the main line station concourse. It is one of two mainline London termini south of the River Thames, the other is Waterloo. The Underground station is on the Jubilee line and the Bank branch of the Northern line. Several London Buses routes, including 43 and RV1, pass the station; some via the bus station. River buses use the nearby London Bridge City Pier. London Bridge station was opened on 14 December 1836, making it the oldest London railway terminus that is still running. It was not the earliest station in the London metropolitan area, as the London and Greenwich Railway had opened stations at Spa Road (in Bermondsey) and Deptford on 8 February 1836. The completion of the line into London Bridge was postponed because of delays in constructing a bridge at Bermondsey Street. From 10 October 1836, trains were able to operate as far as the east end of this bridge, with passengers having to walk the last 300 yards (270 m). The station has had several changes of ownership and complete rebuilds since opening. The original station had four tracks and was 60 feet (18 m) wide and 400 feet (120 m) long. It was approached through a pair of iron gates. Three tracks led into two platforms as a stub end of a viaduct. The station was entirely exposed to the weather until a tarred canvas roof was erected in 1840. Sixteen columns and fourteen beams from this structure were retrieved in 2013 and given to the Vale of Rheidol Railway in Aberystwyth, Wales for use in a planned railway museum. Before completing the train shed, the London and Greenwich Railway entered into an agreement with the proposed London and Croydon Railway for the latter to use its tracks from Corbett's Lane, Bermondsey, and to share its station. However, the Greenwich railway had underestimated the cost of building the long viaduct leading to London Bridge and was not able to build a sufficiently large station for the traffic for both companies, and so in July 1836 it sold some land adjacent to its station (then still under construction) to the Croydon railway to build their own independent station. The London and Brighton Railway and the South Eastern Railway (SER) were also planning routes from London to Brighton and Dover respectively, and the British Parliament decided that the London and Greenwich line should become the entry corridor into London from South East England. The two railways were therefore required to share the route of the London and Croydon Railway from near Norwood (which in turn shared the route of the London and Greenwich Railway from Bermondsey to London Bridge). As a result, in 1838 the London and Croydon Railway obtained powers to enlarge the station it was then constructing at London Bridge, before it had opened for traffic. The London and Croydon Railway opened its line and began using its station on 5 June 1839; the London and Brighton Railway joined it on 12 July 1841, followed by the South Eastern Railway in 26 May 1842. It was soon found that the viaduct approaching London Bridge would be inadequate to deal with the traffic generated by four railways, so it was widened by the Greenwich Railway between 1840 and 1842, doubling the number of tracks to four. The new lines, intended for the Croydon, Brighton and South Eastern trains, were situated on the south side of the existing Greenwich line, whereas their station was to the north of the London Bridge site, leading to an awkward and potentially dangerous crossing of one another's lines. The directors of the companies involved decided to exchange sites; the London and Greenwich Railway would take over the newly completed London and Croydon Railway station, whilst a new joint committee of the Croydon, Brighton and South Eastern companies would demolish the first station and build a new one on its site. Plans for a large new station were drawn up, designed jointly by Lewis Cubitt, John Urpeth Rastrick and Henry Roberts. Drawings were published in the Illustrated London News and George Bradshaw's Guide to the London and Brighton Railway 1844. They show 'a quasi-Italianate building with a picturesque campanile'. It opened for business in July 1844 while only partially complete, but events were taking place which would mean that the bell tower would never be built, and the new building would only last five years. In 1843 the SER and Croydon railway companies became increasingly concerned by the high tolls charged by the London and Greenwich Railway for the use of the station approaches, and gained Parliamentary approval to build their own independent line into south London to a new station at Bricklayers Arms, which was tenuously described as a "West End terminus". This line opened on 1 May 1844 and most of the services from these two companies were withdrawn from London Bridge, leaving only the Greenwich and Brighton companies using London Bridge station. The Greenwich company was on the brink of bankruptcy and so was forced to lease its lines to the SER, which took effect from 1 January 1845. The next year the Croydon and Brighton companies, along with other small railways, merged to form the London Brighton and South Coast Railway (LB&SCR). Consequently, there were only two companies serving London Bridge. The LB&SCR used the unfinished joint station until it was demolished in 1849 and a larger building constructed. The SER took over the second London and Greenwich station (which had been built for the London and Croydon Railway) and sought to develop that site rather than continue to invest in the former joint station, which became the property of the LB&SCR. The SER station was therefore rebuilt and enlarged between 1847 and 1850, to a design by Samuel Beazley. At the same time yet further improvements were made to the station approaches, increasing the number of tracks to six, which entirely separated the lines of the two railways. Once these extensions were complete the SER closed its passenger terminus at Bricklayer's Arms and converted the site into a goods depot in 1852. London Bridge station remained the London terminus of the SER until 1864 when its station was again rebuilt. Five of the existing platforms were converted into a through station to enable the extension of the main line into central London and the opening of Charing Cross railway station, and in 1866 to Cannon Street station. In 1899 the SER entered into a working amalgamation with the London Chatham and Dover Railway (LC&DR) to form the South Eastern and Chatham Railway Companies Joint Management Committee. Junctions were laid to enable trains through London Bridge to reach the LC&DR stations at Holborn Viaduct and St Pauls. The LB&SCR took over the unfinished joint station, which they demolished in 1849 and opened a temporary station in 1850. This was rebuilt and enlarged in 1853-4 to deal with the additional traffic from the lines to Sydenham and Crystal Palace. A three-storey box-like structure in Italian style was erected, with the name of the railway emblazoned on the top parapet. In 1859 the LC&DR applied to the LB&SCR for running powers from Sydenham to London Bridge, but was refused. However, some ticketing arrangement was made between the two companies as the LC&DR advertised connections to and from London Bridge in its timetables in The Times and Bradshaw's Railway Guide for July 1861. This arrangement was short-lived pending the construction of the LC&DR line to Holborn Viaduct. The LB&SCR also built the Terminus Hotel at the station in 1861. It was designed by Henry Currey, architect for St Thomas's Hospital and had 150 public rooms over seven stories. It was unsuccessful because it was on the south bank of the river, so was turned into offices for the railway in 1893. It was destroyed by bombing in 1941. An Act of Parliament of 1862 gave the LB&SCR power to enlarge the station further. Over the next few years under the direction of new Chief Engineer Frederick Banister, the company built four more platform-faces in an adjoining area to the south of its existing station to cope with additional traffic generated by the completion of the South London Line and other suburban lines to Victoria station. This had a single-span trussed-arch roof measuring 88 by 655 ft (27 by 200 m), and was designed by J. Hawkshaw and Banister. During the first decade of the twentieth century LB&SCR station at London Bridge was again enlarged, but overall London Bridge station remained a "sprawling confusion". The South London Line from London Bridge to Victoria was electrified in 1909 with an experimental overhead system. It was successful and other suburban services were electrified including the line to Crystal Palace in 1912. Because of World War I, the line to Croydon was not electrified until 1920. The Railways Act 1921 led to the Big Four grouping in 1923. All of the railways of southern England combined to form the Southern Railway (SR), bringing the London Bridge complex under single ownership. The wall that divided the Chatham and Brighton stations was partially knocked through in 1928 to provide an easier interchange between stations. This allowed a greater range of platforms to be used for the increasingly frequent suburban rail services to London Bridge. Between 1926 and 1928 the Southern Railway electrified the SE&CR suburban lines at London Bridge using a third rail system, adapting the existing LB&SCR routes to it at the same time. The first electric services ran on 25 March 1928 from London Bridge to Crystal Palace via Sydenham, followed by a peak hour service to Coulsdon North on 17 June. This was followed by electric services to Epsom Downs via West Croydon, Crystal Palace via Tulse Hill, and Streatham Hill, and to Dorking North and Effingham Junction via Mitcham on 3 March 1929. At the same time as electrification, the SR installed colour light signalling. The Southern Railway electrified the Brighton Main Line services to Brighton and the South Coast, providing a full service to Three Bridges on 17 July 1932. This was following by a full electric service to Brighton and West Worthing on 1 January 1933, followed by services to Seaford, Eastbourne and Hastings on 7 July 1935 and to Bognor Regis and Littlehampton on 3 July 1938. By the 1930s, a regular feature of London Bridge traffic was a glut of commuter services all departing at or shortly after 5:00 pm. A typical timetable included 12-car services to Brighton, Eastbourne and Littlehampton, all between 5:00 and 5:05. "The fives" continued to run until the mid-1970s. Both the London Bridge stations were badly damaged by bombing in the London Blitz in December 1940 and early 1941. The shell of the two stations was patched up but the former Terminus Hotel, then used as railway offices, was rendered unsafe and demolished. British Railways (BR) took over responsibility for the station in 1948 following nationalisation of the railways. They did not consider London Bridge a priority at first, and the war-torn damage of the station remained into the 1960s. Electrification of the lines into London Bridge continued during the 1950s and 1960s, with the final steam service running in 1964, when the line to Oxted and Uckfield was replaced by diesel / electric multiple units. By the early 1970s the station could no longer cope with the volume of traffic. Between 1972 and 1978, BR significantly redeveloped the station and its approaches. This included a £21 million re-signalling scheme, and a new station concourse designed by N. D. T. Wikeley, regional architect for the Southern Region. This was opened 14 December 1978. New awnings were added over the former SER platforms, but the arched Brighton roof was left. It has been described by The Oxford companion to British Railway History as "one of the best modern station reconstructions in Britain". Patronage to London Bridge tailed off from a peak in the early 1970s. The station remained popular for through routes to the City and the West End, but the number of terminal trains declined significantly by the early 1980s. The bridge over the station's north end became Grade II listed in January 1988, while Platforms 9–16 (the former LB&SCR side) became listed the same that December. In 1991, a "Thameslink 2000" project was proposed that would improve services between London Bridge and the Great Northern lines. It was originally hoped the work would be complete by 1997. A £500 million refurbishment programme was announced by Railtrack in 1999, which would have seen the station complex rotated by 90 degrees, and large amount of shopping space added. Part of the new concourse under platforms 7–9. The station was comprehensively redeveloped between 2009 and 2017 with the rebuilding of all platforms, the addition of two major new street-level entrances, and changes to passenger concourses and retail facilities. The Shard opened next to the station in 2012. It included a new entrance and roof for the terminal level concourse, and a larger bus station was constructed in front of the building. This was followed by a major transformation programme known as Masterplan, linked to the Thameslink programme. Work began in 2012 with the terminal platforms adjacent to St Thomas Street, reducing the number from nine to six and extending them to accommodate longer 12-car trains. Through platforms were increased from six to nine, all of which catered for 12-car trains. [a] In the redeveloped station, Charing Cross services were assigned four new dedicated platforms (6, 7, 8 and 9), and Thameslink services to platforms 4 and 5. The existing platforms for Cannon Street services on the north side of the station were also rebuilt. During the works, Charing Cross trains did not call at the station for most of 2015–16 as the platforms were rebuilt, followed by Cannon Street trains from 2016–17. Thameslink services to/from the Thameslink core did not stop between 2015 and May 2018, when an all day service with significantly enhanced frequency began as the programme of works was completed. The South Eastern Railway's former headquarters in Tooley Street, London, near London Bridge station. As part of the rebuilding works, the listed northern wall of the terminus train-shed was demolished and replaced with a new retaining wall, and the listed bays of the roof over the terminating platforms were dismantled and stored. Each of the rebuilt platforms has its own full length platform canopy. The footbridge dating from the 1970s that linked platforms for passenger interchange was also demolished, replaced by an interchange concourse underneath the platforms accessed by lift, stairs and escalator. This required the demolition of brick vaults between Stainer and Weston Streets, which were pedestrianised and became part of the new concourse. A wider route was created through the Western Arcade to Joiner Street and the underground station by relocating existing shops in to renovated barrel vaults. Two major new street level entrances were opened to the south on St Thomas Street, and to the north, on Tooley Street. This required demolishing the 1893 SER office building. The refurbished station was officially opened by Prince William, Duke of Cambridge on 9 May 2018. The total estimated value of the project was around £220 million. Platforms 1, 2 and 3 serve trains to/from Cannon Street and southeast London and Kent. Platforms 4 and 5 serve Thameslink trains between the Brighton main line and the Thameslink core via Blackfriars. Platforms 6–9 serve trains to/from Charing Cross to southeast London, Kent and East Sussex. Platforms 10–15 serve mainly Southern services toward south London and the south coast. The platforms are linked together by a large street-level concourse, offering a ticket office, retail facilities and waiting areas, with entrances on St Thomas Street and Tooley Street. The Underground station is served by the Jubilee line and the Bank branch of the Northern line. In 2017, it was the fifth busiest station on the network with 69.05 million users. It is the only station on the London Underground network with "London" in its name (while the NR termini are named, for instance, "London Waterloo" the Underground station is simply named "Waterloo"). There are two platforms on each line and two main sets of escalators to and from the Tooley Street ticket hall. All four platforms are directly accessible from the Borough High Street entrance/exit. There is an emergency exit to Joiner Street. The first underground station at London Bridge was part of the second section of the City & South London Railway (C&SLR). 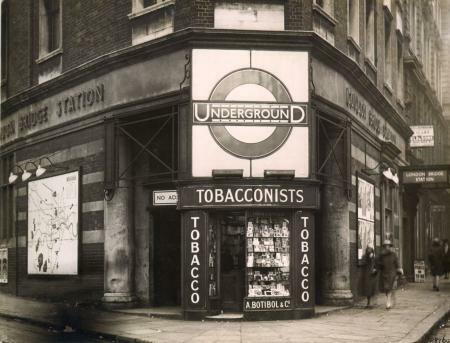 The company had been formed on 28 July 1884 with the intention of constructing a line under the Thames from King William Street to Stockwell via Elephant and Castle and Kennington, which opened on 18 December 1890. No station was provided at London Bridge; the first station south of the river was at Borough. King William Street was found to be badly placed owing to a steep incline towards the station from underneath the Thames, which limited its capacity. When the decision was made to extend the C&SLR northwards to Moorgate, a new pair of tunnels was constructed from north of Borough station on a new alignment providing a more convenient route and the opportunity to open a station at London Bridge. The tunnels to King William Street and the station were closed and the extension and London Bridge station opened on 25 February 1900. 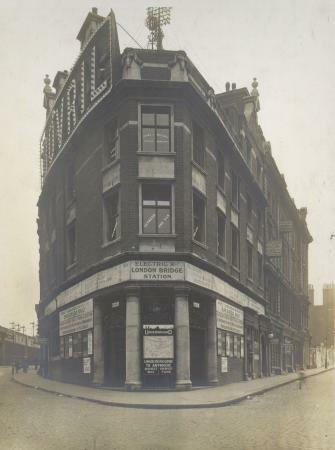 The station entrance was originally at Three Castles House on the corner of London Bridge Street and Railway Approach, but has since been moved to Borough High Street and Tooley Street. The original entrance remained standing until March 2013 when it was demolished. In the aftermath of the King's Cross fire in 1987, an independent report recommended that London Underground investigate "passenger flow and congestion in stations and take remedial action". As a consequence, the congested Northern line platforms were rebuilt during the late 1990s, increasing the platform and circulation areas for the opening of the Jubilee Line Extension. The station is arranged for right-hand running because it is in a stretch of the Northern line (from just south of Borough to just south of Moorgate) where the northbound line is to the east of the southbound, instead of to the west. The Jubilee line station is between Southwark and Bermondsey. It opened on 7 October 1999 as part of the Jubilee Line Extension, although trains had been running through non-stop from the previous month. It took months of major engineering works to relocate buried services in the surrounding streets to enable the Jubilee line's construction. A new ticket hall was created in the arches under the main-line station, with entrances at Joiner Street and Borough High Street. During excavations a variety of Roman remains were found, including pottery and fragments of mosaics; some of these are now on display in the station. The Jubilee line platforms have been fitted with platform screen doors in common with all other stations on the extension. There is a facing crossover to the west of the station enabling trains to terminate here. On 1 February 1884, the 12:05 pm London Bridge to Victoria, hauled by LB&SCR Terrier No.71 Wapping, collided with a D1 tank which was fouling the exit from the platform. Two carriages derailed. On 27 November 1895, a local train hauled by LB&SCR Terrier No. 70 Poplar collided with the buffer stops. On August 1926, a F1 class locomotive overran the buffers and crashed into a brewery. On 9 July 1928, B2X class locomotive No. B210 was in a sidelong collision with an electric multiple unit after the driver of B210 misread signals. Two people were killed and nine were injured, six seriously. On 23 January 1948, a train formed of a 6PAN and a 6PUL unit, which formed that day's 7:30 am service from Ore coupled with the 8:50 am from Seaford, was allowed to draw up to the inner home signal, where it should have stopped. Instead, it overran the signal and collided at a speed of between 15 and 20 mph (24 and 32 km/h) with an empty stock which had formed the 8:20 am from Brighton and was waiting to depart London Bridge's platform 14 for New Cross Gate. This train was formed of two 6PAN units. The train that was struck was forced through the buffers and demolished a bookstall. Two train crew and one passenger were killed and 34 people were injured. On 11 April 1989, a passenger train arriving from Tattenham Corner collided with the buffers. Six people were injured. On 28 February 1992, a bomb planted by the Provisional IRA exploded at the station, injuring 29 people. On 3 June 2017, the station was closed for several hours during a terrorist attack on London Bridge and in nearby Borough Market. ^ Historically, platforms 4, 5 & 6 served services to and from both Charing Cross station and the Thameslink core, creating conflicting moves and capacity problems during peak hours. ^ This figure was decreased by 2.270 million due to methodological changes. Without the changes, the figure would have been 56.121 million. ^ "London Bridge station". Google Maps. Select StreetView to examine the various entrances. Retrieved 18 October 2017. ^ "Standard Tube Map" (PDF). Transport for London. Retrieved 9 April 2018. ^ "Key bus routes in central London" (PDF). Transport for London. Retrieved 18 October 2017. ^ "River Services Map". Transport for London. Retrieved 14 February 2018. ^ a b Jackson 1984, p. 144. ^ a b c Jackson 1984, p. 145. ^ Gordon 1910, p. 187. ^ "London Bridge station roof set for Aberystwyth museum". BBC News Wales. 31 May 2013. Retrieved 4 October 2016. ^ Turner 1977, p. 42. ^ Turner 1977, pp. 26–39. ^ Jackson 1984, pp. 145–146. ^ Turner 1977, pp. 176–9. ^ Cole, David (1958). "Mocatta's stations for the Brighton Railway". Journal of transport history. Manchester: Manchester University Press. 5: 149–157. ISSN 0022-5266. ^ a b c Ellis 1971, p. 223. ^ "A notable station centenary". The Railway Gazette: 966–7. 11 December 1936. ^ Jackson 1984, p. 147. ^ Jackson 1984, pp. 150–1. ^ a b Jackson 1984, p. 152. ^ a b Christopher 2015, p. 152. ^ Turner 1978, p. 23. ^ Jeffs 2013, p. 12. ^ London Railways Track Map for 1870 Establishment and growth. London: Quail Map Company. 1983. p. 23. ^ Jackson 1984, p. 158. ^ "Railway Gazette". 11 December 1936: 966. ^ Bradley 1979, p. 6. ^ Bradshaw 1861, p. 16. ^ a b The Times Wednesday, 5 December 1860, p.2. ^ Jackson 1984, pp. 191,195. ^ Jackson 1984, p. 154. ^ Jackson 1984, pp. 156–157. ^ Thomas 1963, p. 26. ^ a b "Federick Dale Banister". GracesGuide.co.uk. Retrieved 10 February 2013. ^ Turner 1978, pp. 185–193. ^ Heap 1980, p. 78. ^ Davidson, John (1909). Fleet Street and Other Poems. London. ^ Turner 1979, pp. 172–179. ^ Turner 1978, pp. 206–207. ^ a b Jackson 1984, p. 160. ^ Jackson 1984, p. 162. ^ a b Jackson 1984, p. 161. ^ Jackson 1984, p. 167. ^ Jackson 1984, pp. 166–167. ^ Eddolls 1983, pp. 31–32. ^ Jackson 1984, p. 356. ^ Historic England (8 January 1988). "Bridge Over North End, London Bridge Station (1385629)". National Heritage List for England. Retrieved 16 February 2018. ^ Historic England (19 December 1988). "London Bridge Station, Platforms 9–16 (Brighton Side) (1385808)". National Heritage List for England. Retrieved 16 February 2018. ^ Gourvish & Anson 2004, p. 314. ^ Dynes, Michael (25 September 1991). "Faster London rail links planned". The Times. London, England. p. 3. Retrieved 16 February 2018. ^ Shah, Saeed (20 November 1999). "London Bridge station set for £500m redesign". Times. London, England. p. 26. Retrieved 16 February 2018. ^ "Spotlight on Christmas 2017: Thameslink Programme". Network Rail. 2017. Retrieved 16 February 2018. ^ Network Rail 2005b, p. 17, paragraph 2.25. ^ "London Bridge Redevelopment" (PDF). Archived from the original (PDF) on 6 August 2013. Retrieved 11 December 2016. ^ Somers, Mark (7 May 2014). "THAMESLINK PROGRAMME" (PDF). www.infrarail.com. Network Rail. Retrieved 15 February 2018. ^ "Thameslink KO2 Presentation" (PDF). Retrieved 11 December 2016. ^ "Thameslink Programme". Retrieved 11 December 2016. ^ "London Bridge rebuild moves into final phase". Thameslink Programme. 6 September 2016. Retrieved 9 April 2018. ^ "No Charing Cross trains to call at London Bridge rail station from Monday". www.thameslinkprogramme.co.uk. ^ "Major service changes until January 2018". www.thameslinkrailway.com. ^ "Major Service changes until 2018 during London Bridge work". Thameslink Railway. Retrieved 16 February 2018. ^ Network Rail 2005b, p. 17, paragraph 2.27. ^ "First new platforms of rebuilt London Bridge Station take shape". london-se1.co.uk. ^ Network Rail 2005b, p. 17, paragraph 2.26. ^ Network Rail 2005b, p. 17, paragraph 2.24. ^ "How Far Should We Go in Sacrificing Our Heritage For 21st Century Enterprise?". Huffington Post. 16 January 2012. ^ "Balfour Beatty proud to be part of the transformation of London Bridge station". Balfour Beatty (Press release). 10 May 2018. Retrieved 15 June 2018. 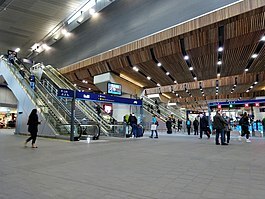 ^ "New station control office unites rail staff at London Bridge as concourse opening approaches". Network Rail Media Centre. 2 June 2016. Retrieved 14 February 2018. ^ "London Bridge improvements". Network Rail. Retrieved 14 February 2018. ^ a b c Southeastern 2017, Select "Timetable 5 – London to Dartford". ^ a b Southeastern 2017, Select "Timetable 6 – London to Hayes and London to Sevenoaks via Grove Park". ^ a b Southeastern 2017, Select "Timetable 4 – London to Hastings". ^ Southeastern 2017, Select "Timetable 3 – London to Ashford International". ^ Southeastern 2017, Select "Timetable 1 – London to Tonbridge". ^ "May timetable". South Eastern Railway. Retrieved 20 June 2018. ^ "Timetables". RailPlan20/20. Retrieved 20 June 2018. ^ "New Train Routes". Thameslink Railway. Retrieved 20 June 2018. ^ "Key dates and service changes". Thameslink Railway. Retrieved 20 June 2018. ^ a b c d e f "Multi-year station entry-and-exit figures" (XLSX). London Underground station passenger usage data. Transport for London. January 2018. Retrieved 22 July 2018. ^ a b Day & Reed 2010, p. 207. ^ "Multi-year station entry-and-exit figures" (XLSX). London Underground station passenger usage data. Transport for London. January 2018. Retrieved 22 July 2018. ^ "Standard Tube Map" (PDF). Transport for London. Retrieved 26 August 2017. ^ London Bridge Axonometric Map (Map). Transport for London. Retrieved 16 June 2018. ^ Day & Reed 2010, pp. 40, 43, 44. ^ a b Rose 1999. ^ a b Day & Reed 2010, p. 46. ^ Louise Coysh, ed. (2014). Labyrinth: A Journey Through London's Underground by Mark Wallinger. Art / Books. p. 95. ISBN 978-1-908-97016-9. ^ Fennell 1988, p. 169. ^ Eng., Mitchell, Bob, C. (2003). Jubilee Line extension : from concept to completion. London: Thomas Telford. p. 23. ISBN 0727730282. OCLC 51945284. ^ Yonge, John (November 2008) . Jacobs, Gerald (ed.). Railway Track Diagrams 5: Southern & TfL (3rd ed.). Bradford on Avon: Trackmaps. map 39B. ISBN 978-0-9549866-4-3. ^ Horne 2000, p. 80. ^ Day & Reed 2010, p. 201. ^ Day & Reed 2010, p. 210. ^ "Boudicca rampaged through the streets of south London". New Scientist. 21 October 1995. Retrieved 1 October 2017. ^ "Mind The Gap". Railway Technology. 9 February 2009. Retrieved 16 February 2018. ^ "Inter Infraco Track Boundaries" (PDF). ^ "Detailed London transport map". ^ "Accident Archive :: The Railways Archive". www.railwaysarchive.co.uk. ^ a b Middlemass, Tom (1995). "Chapter 5". Stroudley and his Terriers. York: Pendragon. ISBN 1-899816-00-3. ^ Trevena, Arthur (1980). Trains in Trouble. Vol. 1. Redruth: Atlantic Books. p. 34. ISBN 0-906899-01-X. ^ Moody, G. T. (1979) . Southern Electric 1909–1979 (Fifth ed.). Shepperton: Ian Allan Ltd. p. 37. ISBN 0 7110 0924 4. ^ Moody, G. T. (1960). Southern Electric: the history of the world's largest suburban electrified system (3rd ed.). Hampton Court: Ian Allan. p. 138. ^ McCrickard, John P (6 October 2016). "January 1989 to December 1989". Network South East Railway Society. Retrieved 26 June 2018. ^ Tendler, Stewart (29 February 1992). "IRA rush-hour bomb injures 29 at station". The Times. London. ^ Gourvish & Anson 2004, p. 350. ^ Booth, Robert; Dodd, Vikram; O'Carroll, Lisa; Taylor, Matthew (4 June 2017). "Police race to establish if London Bridge attackers were part of network" – via The Guardian. Bradley, D.L. (1979). The Locomotive History of the London Chatham and Dover Railway. Railway Correspondence and Travel Society. ISBN 0-901115-47-9. Bradshaw, George (1861). Bradshaw's monthly railway and steam navigation guide. Bradshaw. Christopher, John (2015). London's Historic Railway Stations Through Time. Amberley Publishing Limited. ISBN 978-1-445-65111-8. Eddolls, John (1983). The Brighton Line =. Newton Abbott: David & Charles. pp. 31–2. ISBN 0-7153-8251-9. Ellis, C. Hamilton (1971). The London Brighton and South Coast Railway. Shepperton: Ian Allan. ISBN 0-7110-0269-X. Fennell, Desmond (1988). Investigation into the King's Cross Underground Fire (PDF). Department of Transport/HMSO. ISBN 0-10-104992-7. Retrieved 20 September 2017. Gordon, W.J. (1910). Our Home Railways. Frederick Warne. Heap, Christine and van Riemsdijk, John (1980). The Pre-Grouping Railways part 2. H.M.S.O. for the Science Museum. ISBN 0-11-290309-6. Horne, M (2000). The Jubilee Line. Capital Transport Publishing. Ransom, P.J.G. (1990). The Victorian Railway and How It Evolved. London: Heinemann. ISBN 978-0-434-98083-3. Simmons, Jack (1991). The Victorian Railway. London: Thames & Hudson. ISBN 978-0-500-25110-2. Simmons, Jack; Biddle, Gordon, eds. (1997). The Oxford companion to British Railway History. Oxford: Oxford University Press. p. 291. ISBN 0-19-211697-5. Thomas, David St. John (1963). A Regional History of the Railways of Great Britain: Greater London. David and Charles. Turner, J.T. Howard (1977). The London Brighton and South Coast Railway. 1. Origins and formation. London: Batsford. pp. 41–2. ISBN 0-7134-0275-X. Turner, J.T. Howard (1978). The London Brighton and South Coast Railway. 2. Establishment and growth. London: Batsford. p. 23. ISBN 0-7134-1198-8. Turner, J.T. Howard (1979). The London Brighton and South Coast Railway. 3. Completion and maturity. London: Batsford. pp. 172–9. ISBN 0-7134-1389-1. "Thameslink 2000 Statement of Case March 2005" (PDF). Network Rail. March 2005. Archived from the original (PDF) on 8 June 2011. "London Bridge redevelopment" (PDF). Publicity leaflet. Network Rail. 9 May 2011. Archived from the original (PDF) on 8 November 2011. Retrieved 10 April 2013. "London Bridge – a vision for the future" (PDF). Public information display panel. Network Rail. 6 May 2011. Archived from the original (PDF) on 31 January 2012. Retrieved 10 April 2013. "London Bridge – a bigger, better station" (PDF). Public information display panel. Network Rail. 9 May 2011. Archived from the original (PDF) on 8 November 2011. Retrieved 10 April 2013.